When we think of Harry Houdini, what inevitably comes to mind is the image of an athletic man in underclothes, loaded with chains and escaping from the most unlikely of prisons: a water tank, a safe or a milk jug sealed with padlocks. But perhaps the greatest exploit of escapism of the most famous magician of all time was to rid many others of the deceptions of mediums and spiritualists. There was not one Houdini, but two: until 1922 he was the show man and even the silent movie star, in his last years he was the hunter of fake ghosts. 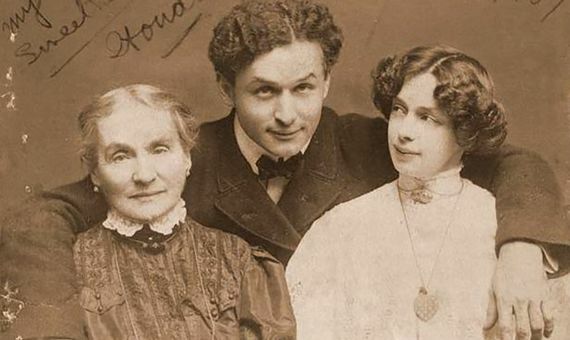 According to the most popular version, it was the death of his mother that led Houdini (March 24, 1874 – October 31, 1926) towards spiritualism. Since his birth in Budapest, through the emigration of his family to the US and his triumph as a magician, Erik Weisz – his real name – always professed a deep adoration for his mother, whom he qualified as his angel on Earth, the lighthouse who guided him and one of his two loves, along with his wife Bess. 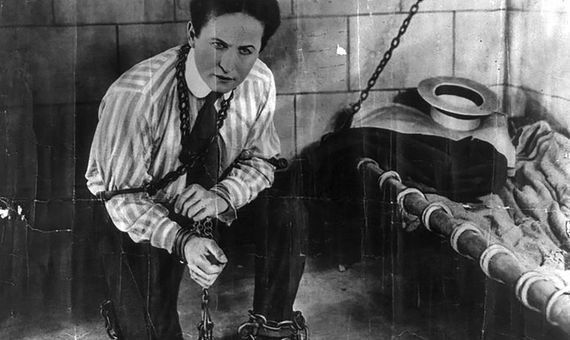 After the death of his mother, in 1913 because of a stroke, Houdini was not the same again. He became a taciturn specter who spent long periods in the cemetery, lying on the grave and talking to the earth. According to this version, from then on he began to attend séances to contact his mother, which led him to discover the deceptions of the mediums and to initiate his personal crusade against this fraud. However, that was not how it happened. On the one hand, Houdini’s biographers note that his attendance at those sessions did not begin until almost a decade after the death of his mother. On the other, that his interest in spirits was not something that had come about because of that tragic event, as a child he had already seen sessions and began to suspect that they were a cheat. But it is true that his mother would have a role in that conversion of the magician in an active claimant of paranormal scams. 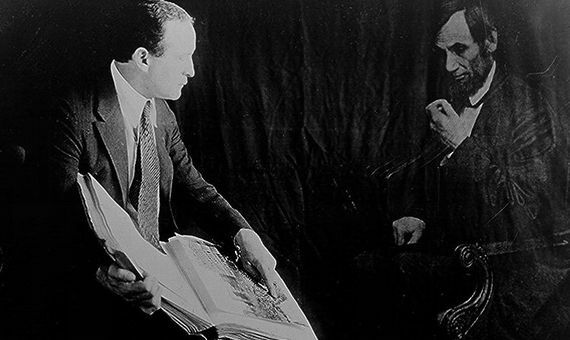 The birth of that second Houdini had a specific date and parents: Arthur Conan Doyle and his wife Jean, with whom the magician made a great friendship during a British tour in 1920. The Conan Doyle were great believers in spiritualism and the wife of the The creator of Sherlock Holmes even practiced as a medium. 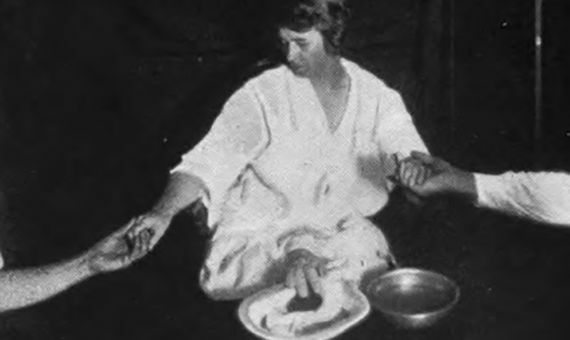 On June 17, 1922, during an evening that brought together the Conan Doyle and the Houdini in Atlantic City, Lady Doyle offered to practice a session to contact the wizard’s mother. The result was 15 pages of automatic writing in which supposedly the mother of Houdini communicated with her son in perfect English and under the sign of the cross. All this aroused in the magician something more than suspicions: his mother never knew how to write in English and hardly the wife of a rabbi would have drawn a cross. So it was until Conan Doyle began publicly presenting Houdini as a believer, then he had to react. “But as much as he tried, he could not persuade him – Conan Doyle – that there was a trick in that,” Polidoro continues. Both celebrities became embroiled in a public controversy that newspapers and their readers eagerly followed: “they clashed and their friendship ended with a cross fire of bitter comments”. I am Houdini! And you are a fraud! For his part, Houdini was determined to discredit as many mediums as he could. His knowledge of magic allowed him to find out the tricks used by spiritualists, whose sessions he attended disguised and accompanied by incognito policemen, to finally light a flashlight that left the deception in the open and stand up to the cry of “I am Houdini! And you are a fraud! “His experiences would be collected in 1924 in his book A Magician Among the Spirits. The case of Margery supposed the definitive rupture between Houdini and Conan Doyle. “They never had the opportunity to reconcile”, concludes Polidoro, the magician died of peritonitis at 52 years. But ironically, in a way he continued his work from the grave: for ten years his wife Bess organized séances on Halloween night – the anniversary of the magician’s death – in which he urged the mediums to guess the secret code they had agreed upon. with her husband (Rosabelle believe, alluding to a song). One of them, Arthur Ford, came across the message, but years later it was revealed that it was also a fraud. Inspired by Houdini, in 1964 the magician James Randi offered a thousand dollars to anyone who exhibited scientifically verifiable paranormal powers. Over time the amount was increasing: in 1996 it was one million dollars. After more than a thousand applicants, in 2015 the contest closed without demonstration that the paranormal is real.